Another month of 2014 has come and gone. A big, warm welcome to my absolute favourite month of the year. The weather is temperate, the leaves are beautiful, Thanksgiving rolls around, apples are in season, it's acceptable to consume everything with pumpkin in it. 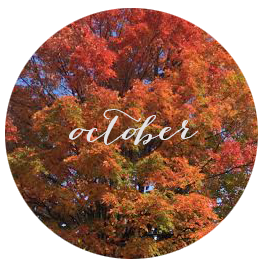 It's also the month just before November, which is always dark and dreary, which may be where my appreciation for everything-October stems from. The start of a new month is always a great opportunity to look back on what you accomplished over the last 30 days and what you'd like to tackle over the next 30! Or in this case, 31! I'll review these goals half-way through the month as a progress report, and again at the end to determine if they were accomplished. And there you have it! I hope September was good to you, and I hope you are just as excited for what October will bring.